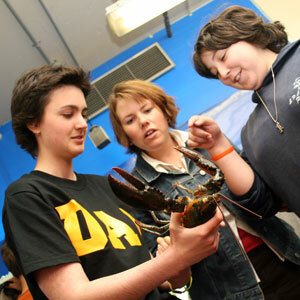 No desks, no books and hundreds of underwater creatures: this was no ordinary school day for Allison WiltonÕs grade seven class from Eastern Passage Education Centre. The 45 students were invited guests of the Aquatron Laboratory, the Faculty of Science and the Office of Research Services in celebration of World Oceans Day on June 8. Oceans Day, first declared by the United Nations almost 15 years ago, seeks to raise awareness about the life-sustaining role of the oceans and inspire people to take better care of our seas and their natural resources. The class was the first to tour the Aquatron Education Centre, a new facility that provides a hands-on look at ocean studies. The students saw a selection of tropical fish and corals and eagerly pressed up against the glass at the AquatronÕs pool tank to witness hundreds of local pollock, haddock, halibut and Atlantic salmon get their lunch. Without question, the highlight for most was the touch tank. The students were practically bursting with excitement as they crowded around the tank for a chance to hold the squirting sea cucumbers and snapping crabs. The group heard from two current Dalhousie students about working in ocean studies. Stephanie Milne spoke about her work with dolphins in Hawaii and Diego Ibarra encouraged the youngsters to consider a career in ocean sciences by comparing it to three things that teenagers love: dating, video games, and the television show CSI. The class also received a tour of the Dalhousie campus.